How much is Enrique Peña Nieto Worth? Enrique Pena Nieto net worth: Enrique Pena Nieto is a Mexican politician who has a net worth of $20 million. Enrique Pena Nieto was born in Atlacomulco, Mexico in July 1966. 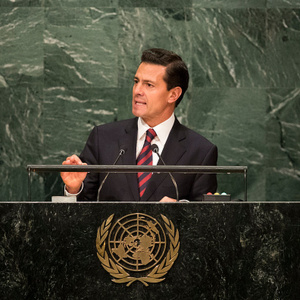 Pena Nieto is the current President of Mexico. He started his six year term in 2012. Pena Nieto is a member of the Institutional Revolutionary Party was the governor of the State of Mexico from 2005 to 2011. He was declared president-elect in 2012 amidst accusations of electoral fraud. He gained 38% of the votes and did not hold a legislative majority. Tens of thousands of people across Mexico marched against Pena Nieto. He pledged to fight against organized crime and the drug trade and promised that his government would be democratic, modern, and open to criticism. He has appeared twice in Forbes Magazine's List of the World Most Powerful People, ranking 37th in 2013 and 60th in 2014. Enrique married Monica Pretelini in 1993 and the couple had three children together. Pretelini passed away during Pena Nieto's second year in office. He has been married to former model/TV presenter Angelica Rivera since 2010. In 2014, Angelica made headlines when it was revealed that a Mexican business tycoon named Juan Armando Hinojosa Cantu, who earned his fortune off government contracts, had given the actress a $7 million mansion. The tycoon reportedly received $3.5 billion worth of government contracts, many of which were given without competitor bids. Angelica would later claim it was not a gift but a loan that would be paid back with her own acting earnings. A Mexican financial outlet investigated how much the typical soap actress earns at Angelica's former employer and concluded the highest-paid stars earned 5 – 8 million pesos per year. That's the same as around $265,000 – $500,000 per year. Actors are also typically signed-on for 5 year exclusive contracts. The implication here being that it would be extremely hard to understand how Angelica could have enough personal wealth to afford a $7 million mansion. According to his 2014 wealth disclosure, Enrique listed a total net worth of 45 million pesos and an income of 3.4 million pesos. At the time those values were worth the same as $3.3 million USD and $180,000, respectively. His main assets included four houses, an apartment, land, art coins and jewelry. $100 million bribe? 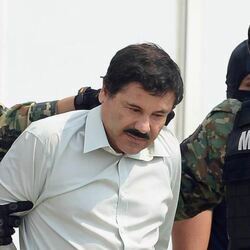 During the January 2019 trial of drug lord El Chapo Guzman, one of Chapo's former associates claimed that the Sinaloa cartel paid Enrique Peña Nieto a $100 million bribe. Actually the allegation was even worse. According to the testimony, Enrique is the one who approached the cartel soon after his 2012 election reportedly demanding a $250 million bribe to call off a nationwide manhunt for the drug lord. Chapo negotiated the bribe down to $100 million. The witness also claimed that the cartel's biggest rival paid Enrique's predecessor Felipe Calderon a similar bribe while he was in office.